Are you looking for a simple yet visually appealing reference chart for American Sign Language (ASL)? Then look no further! Here I have a one-page chart of each sign from A to Z on USA Tabloid size. Once laminated, the page has been laid out with three separate cutting guide lines. Once cut out, these can then be stuck onto students desks (eg: similar to a nameplate/desk plate), so students can be "learning" the signs each day without even realising it. Soon I will be listing some activity sheets for students to practice the signs they've been learning. One activity sheet will have a range of 2-letter words to answer in ASL; another as 3-letter words; 4-letter words; right up to 5-letter words. These activity sheets will be listed both individually as well as bundled. Keep an eye on my store listings for those very soon. 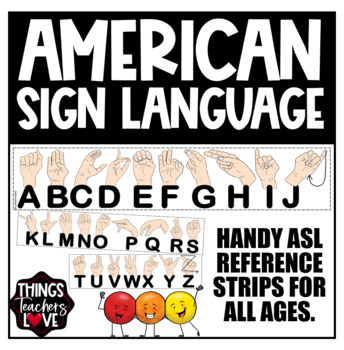 American Sign Language; American; american; America; america; sign; language; ASL; hearing impaired; assistance; reference; reference chart; ready to laminate; Love My Printables.